Similar to the BPX wired beltpacks, these intercom stations have a spring-steel clip to fasten to a belt. An XLR connector is provided for a headset which is used for communication with other intercom stations connected to the network. The beltpacks connect over a DECT wireless link to Green-Go antenna stations. The antenna stations, in turn, connect to a suitable network switch, which provides power over ethernet, via an RJ45 connector and ethernet cable. 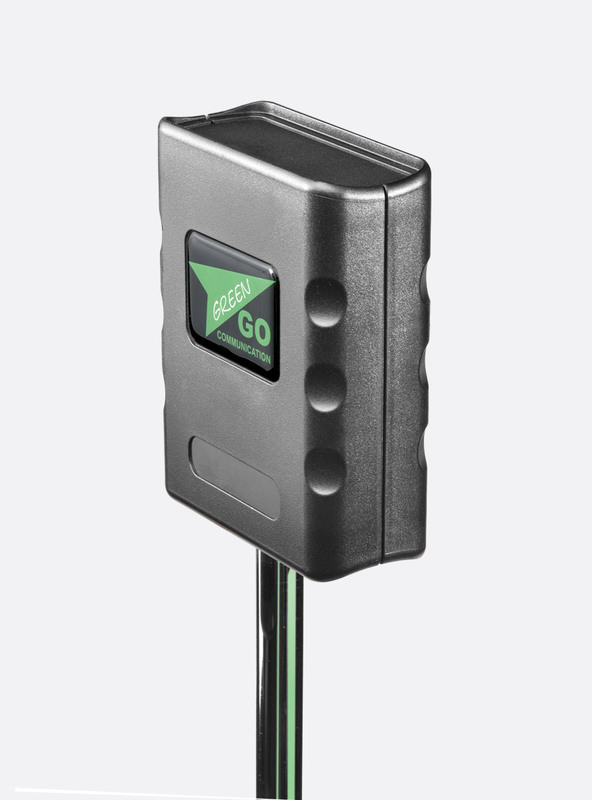 The Green-GO DECT (Digital Enhanced Cordless Telecommunications) wireless devices operate in the 1.9GHz band which is license-free in Europe, Japan and the USA. Operation is full duplex, with clear audio quality, low latency and robust RF coverage. 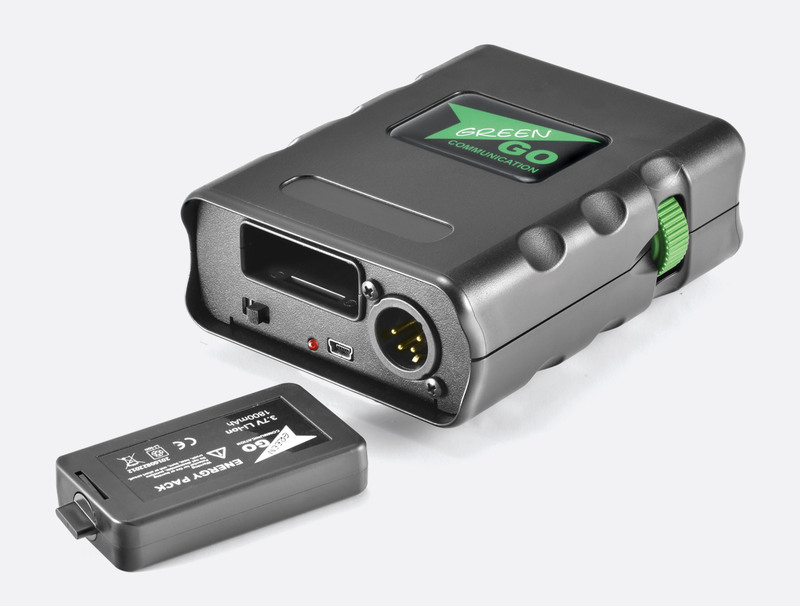 Call-alert and remote-mic-kill control signals are transmitted between Green-GO wired and wireless devices. With a similar feature set to their wired counterparts, DECT beltpacks can access the same 32 channels, 250 groups, and 3000 users that wired user stations access. DECT transmission power and frequency bands: 23 dBm, 1881MHz - 1897MHz, EU. 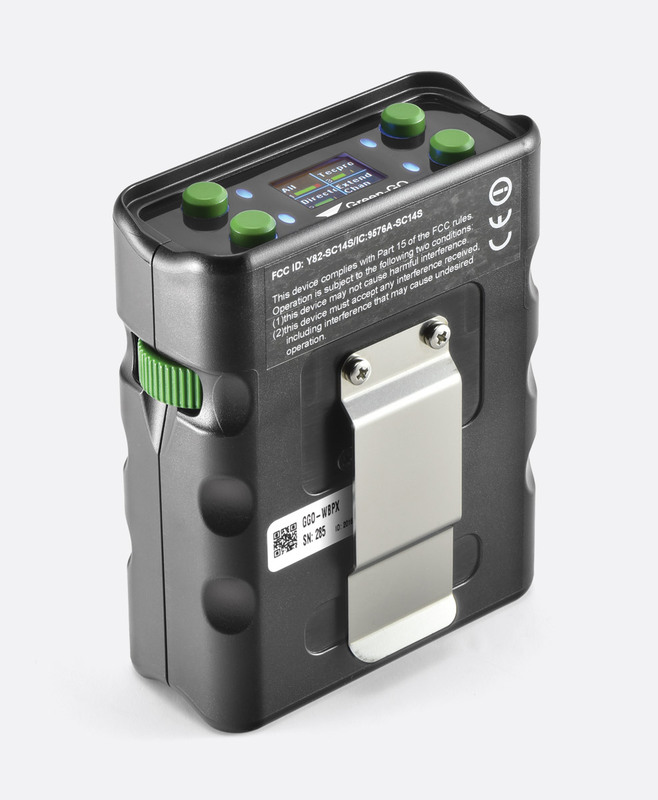 Green-GO WBPX DECT wireless beltpacks share most features with their BPX wired siblings, making switching between wired and wireless devices easy, with no need to learn additional operating systems. The tough, lightweight ABS case is weather resistant, making it suitable for sports and other outside events. A rear mounted belt clip provides a solid fix to clothing. RF range is typically 50m - 300m depending on the local environment. For best results, it is good practice to place antennas at height for best 'line-of-sight'. RF coverage can be increased through the use of remote antennas. Placing a remote antenna behind a thick brick wall will solve the line-of-sight issue. Up to four beltpacks can register to a single WAA antenna. Each beltpack can register with up to four WAA antennas. WBPX beltpacks are powered by a single, quick release, Li-Ion battery which provides around six hours of continuous use from a full charge. 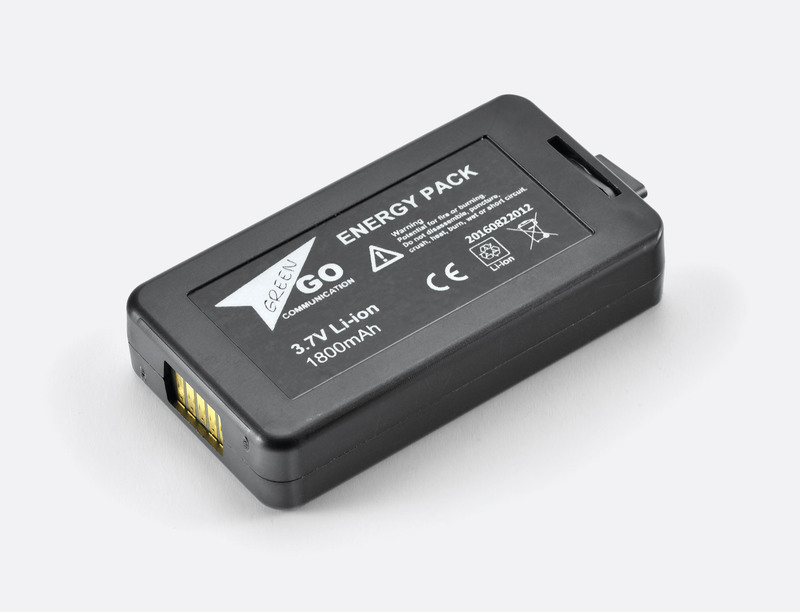 The battery may be charged within the beltpack or in an optional GGO-BC6 6-way charger, 1U. Spare batteries are available, allowing hot swapping. WBPX beltpacks offer 2, 3 or 4 channel operation. 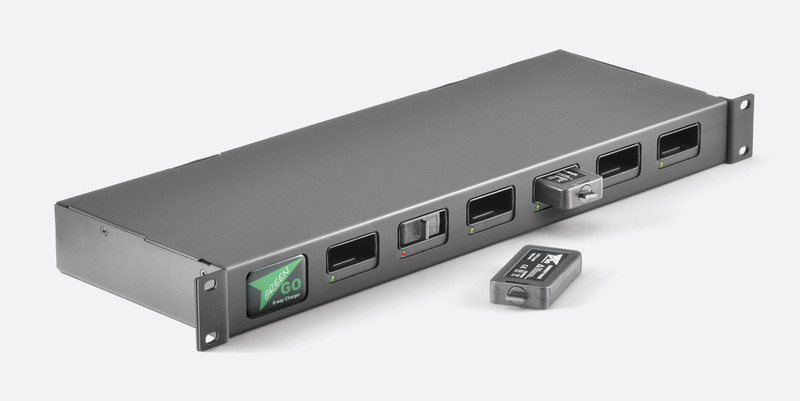 In common with other green-GO user stations, they can store within the memory of the device a mixture of up to 32 groups or users which can be swiftly assigned to any of the four channels. Unassigned channels can still be accessed using the 'extended channels' function. With a frequency response extending to 7kHz, audio quality is clear, with low noise and low latency, eliminating lip-sync problems. Four push buttons provide latching and non-latching microphone switching. The bright, multi-colour Oled display shows each channel's status together with 'Call Alerts','Cue' prompts and other information. The brightness of the display may be adjusted to suit the environment. Two dual-function rotary-encoder wheels, positioned on either side of the beltpack, allow easy operation by left and right handed users. Each encoder wheel can be programmed to offer main volume, side tone, or programme audio level. For clearer monitoring, the audio level of each of the four intercom channels may be set locally to ensure each channel can be heard at a sensible level. Overall audio level can be adjusted to suit. Basic beltpack information is displayed on the Oled screen when either of the encoder wheels is pulled upwards until it clicks. Lifting both wheels upwards accesses the menu for editing, where a wide range of options can be set. These include channel selection (2, 3 or 4), channel assign, comprehensive audio settings, set 'User', antenna pairing and system configuration. 'Programme' audio level may be adjusted locally and can be set to dim or mute when intercom channels are active. Most popular brands of headset are suitable for use with WBPX beltpacks. Tecpro single and dual muff headsets offer a good match, combining clear, intelligible audio with comfort and ruggedness. Switchable DC bias voltage is available for headsets with electret microphones. The physical design combined with a comprehensive feature set makes this wireless beltpack eminently suitable for many applications including broadcast, theatre, music and sport. Dimensions: 120 x 98 x 47mm. Weight: 342g. The 4-pin, male, XLR, headset connectors are compatible with headsets with an impedance greater than 32 ohms and fitted with mating connectors such as those from Tecpro, Beyer and many other brands. If the microphone type is an electret, a switchable bias voltage is available. Offered as a spare for the WBPX Wireless Beltpack, this is a quick release type, for 'hot swapping'. Battery life: Approximately 6 hours continuous use from fully charged. Charge time: Approximately 5 hours from fully discharged. Dimensions: 73 x 38 x 14mm. Weight: 46g. 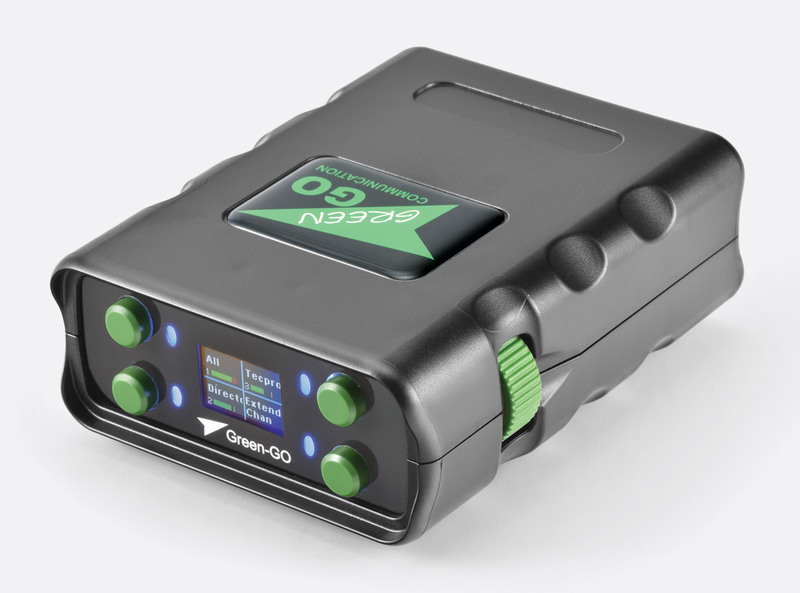 The Green-GO BC6 is a 1U rackmounting, 6-way battery charger. Individual two colour LEDs indicate whether each battery is charging or is fully charged. Power is provided by an external plug-top power supply. For use with Green-GO NRGP batteries only. Dimensions: 1U x 150mm deep. Weight: 2.25kg. WAA antennas have a lightweight, weather resistant, ABS case, making them suitable for sports and other outside events. A right angled mounting bracket makes it simple to fit to microphone stands with a 3/8 inch thread. RF range is typically 50m - 300m depending on the local environment. For best results, it is good practice to place antennas at height for best 'line-of-sight'. RF coverage can be increased through the addition of remote antennas. Placing a remote antenna behind a thick brick wall will solve the 'line-of-sight' issue. Up to four WBPX beltpacks can register to a single WAA antenna. Each beltpack can register with up to four WAA antennas. Antennas communicate with other Green-GO devices via a shared data network. They require Power over Ethernet to operate. The single LED indicates power available, communications established and beltpack pairing. WAA antenna firmware is updated via the data network. Dimensions: 120 x 98 x 42mm, antenna; 60 x 30mm (mounting bracket). Weight: 192g.